February 4-8 is National School Counseling Week. We are highlighting the important work school counselors do and the challenges they face in schools today. What are some of the challenges in school counseling today? Young people today are faced with many challenges that did not exist a decade ago. Bullying is no longer just happening on school grounds, but also in cyber world. Equity gaps continue to persist in relation to race, gender, and socio-economic status. The workforce is rapidly changing with advances in technology. School counselors have the challenge of supporting students through these pervasive social issues and changing times. Despite these nuances in today’s society, the greatest challenge that school counselors face is, believe it or not, professional identity! School counseling is a profession that many people struggle to understand. Some school counselors are given duties that are not aligned with the American School Counselor Association (ASCA) framework and are serving large caseloads. ASCA recommends a student to counselor ratio of 250:1. What impact can school counselors make on students today? School counselors work in three domains: academic, social-emotional, and college-career. School counselors are in a critically important position to help students break down barriers and gain access to college; help students learn skills to successfully navigate social situations; and help students build a strong academic profile. Because school counselors are some of the only school professionals who have access to a wide-variety of information regarding students, they can often be the missing link that helps propel students forward to future success. What life lessons have you learned being a school counselor? Having had the opportunity to listen to so many personal stories: the stories that are not always heard or seen; I have learned to always look beyond the surface. I have learned that despite differences, we all have the capacity to connect with one another. And when we break down these walls of difference, we all have the ability to heal. Positive relationships are critical to create change. This work cannot be done alone. When we build a climate of mutual respect, we thrive. What ONE thing do you want your students to know? Life is not easy. It is not what it seems like on television. It is hard work at times. We must always expect to fail and to experience roadblocks. At the same time, we should never underestimate our ability to bounce back. We all have the ability to be resilient. Resiliency comes from knowing that failure is part of life, that struggling is part of life, and that we can recover and persevere. Always prepare for failure and setbacks: have a support system around you, know yourself and your strengths. If you could change one thing about school counseling, what would it be? There would absolutely, positively be a student to school counselor ratio of 250:1 in EVERY school throughout a child’s P-12 education in EVERY school throughout the nation! Imagine the possibilities! What did it mean to you to be chosen as the 2018 National School Counselor of the Year? In my view, being chosen to be the 2018 National Counselor of the Year was never about me. It was about my profession: shining a light on the work that school counselors do to ensure student success. It was about the community I served in North Lawndale known for its violence and crime. In my small way, I felt I could shine a light on all of the positive work happening in the North Lawndale community. It was about Chicago Public Schools. In my small way, I felt could shine a light on the positive work being done to improve student achievement in Chicago. I am just so grateful and honored to say that I am part of this work. And, so grateful for all of the opportunities that this award has brought. We are so grateful for the collaboration between the American School Counselor Association and former first lady, Michelle Obama’s REACH Higher Initiative and Better Make Room Campaign. REACH Higher and Better Make Room helped to shine a light on this profession and the important work that school counselors do. It all just gives me energy and just makes me want to work harder! Kirsten Perry is a K-12 school counseling specialist for the Chicago Public Schools. She was named the National School Counselor of the Year in 2018 by the American School Counselor Association. 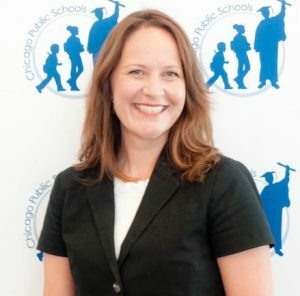 Kirsten served as a P-8 school counselor for seven years in Chicago Public Schools. It is her passion to develop comprehensive school counseling programs that work to create change and close the achievement gap.